The late 1980s and 1990s was an important time in Brighton’s gay and lesbian cultural history. This period saw expanding public knowledge of the stories and events in the lives of a largely silent community in the form of shows, exhibitions, magazines and books. New important measures were taken to protect the community from victimisation, and to support it through celebrations, such as the alternative Miss Brighton contest, the first Pride in the Park in 1992, and earlier, in 1989, Club Shame, set up by Paul Kemp and held at the Zap Club on Wednesday nights. Gay Times called Club Shame “the blueprint of gay clubbing for the nineties” with its unique blend of performance art and rave culture. It attracted a cutting-edge dance crowd from places beyond Brighton and a specific bus for the night transported Londoners down to the South Coast; Shame was a great success, paving the way for a broader, less localised gay nightlife in the city from then onwards. Today, Club Shame no longer exists, but has been reincarnated in the form of Wild Fruit, a monthly club night held at Creation, and is perhaps the biggest, most renowned event on the gay social calendar. Club Shame was quite simply the best club experience of the time, gay or straight, and has never been bettered. I stumbled across it whilst exploring gay Brighton in the very late 80s, and I couldn’t believe my luck. Other clubs were like school discos compared to Shame. I wasn’t out at the time and didn’t tell many people about where I went on Wednesdays. Now I brag about it and say “I was there”. I particularly remember a sci-fi theme night and a live appearance by the 49ers – well one of them anyway. You have to understand that there was nothing like this anywhere else on the South Coast and probably not elsewhere either. It’s importance and legacy stems from the fact that it wasn’t just a breakthrough in gay liberation, but a standard bearer for the whole 90s rave/clubbing scene. It smashed through the glass ceiling which had limited the British gay scene. The gay world led the straight world for the next decade, I would say taking the baton from Studio 54. I watched hairstyles, clothing, music and even bar drinks migrate from gay to straight over the years from ’89 to about ’94. Generally it took about a year for the straights to catch up. The music was fantastic. I still listen to The M&H band’s version of Popcorn – and it still reminds me of Shame, as does Wow Wow Na Na by Grandplazz. The world needs a new shock. The straight scene has overtaken again. The best looking guys are straight now. Time for a new Shame? You did it so well! You should do a Shame compilation album. I’d buy it. I have just discovered your article about Shame and feel compelled to leave a comment – I was a student in Brighton 1991/94 and that was when I was 19 – just coming out and finding out about what Brighton nightlife had to offer! 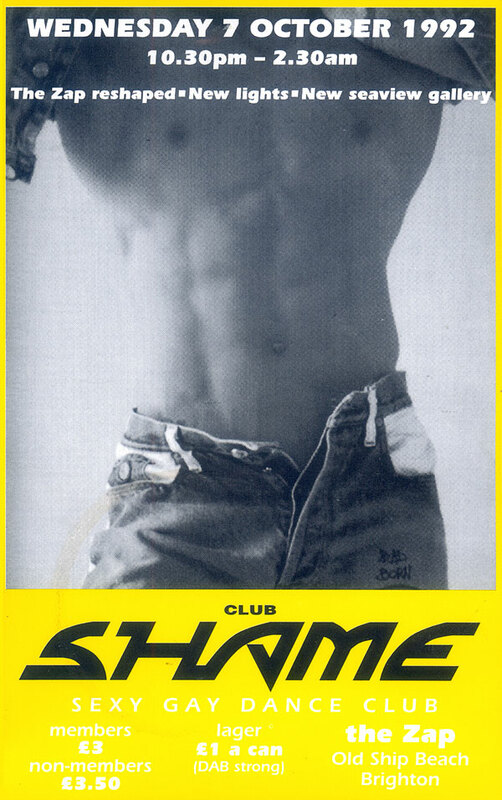 Club Shame was my first experience of a real Gay night in Brighton – I remember it was also my first time taking ecstasy – wow, what a combination! Club Shame was a Brighton institution – I remember queuing outside the Zap in the depths of winter to get into Shame with all my straight and gay mates – we didn’t worry about the cold, just wanted to get inside and dance our little socks off to the fantastic music that made Shame what it was! Shame was the place you could take anyone to – it welcomed all and the atmosphere was really warm and friendly! I was working part time in a hotel and a lot of my colleagues used to come and really let themselves go at Shame – we even got a very straight acting chef to come down with us and he ended up on a podium with his t-shirt off! Craig Woodrow – if you read this can you email me at nicksquires@hotmail.co.uk – I would love you to do a Shame CD of all that fab music you played to us then. Cheers. I agree with Nick. I’d love to hear that music again… Craig Woodrow CD? Or a playlist so we can download the tracks?